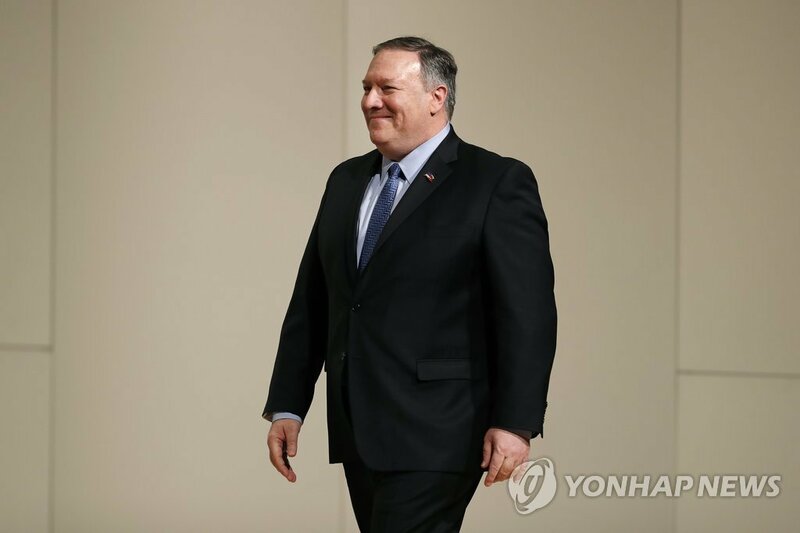 WASHINGTON, March 12 (Yonhap) -- U.S. Secretary of State Mike Pompeo called on North Korea Tuesday to act on its pledge to dismantle its nuclear weapons program. In an interview in Houston, Texas, where he will attend an energy conference, Pompeo said North Korean leader Kim Jong-un had told him face to face "no less than half a dozen times" that he would denuclearize. "Now we need to figure out how to do it, how to achieve it," he told KRIV Fox 26 Houston Morning News. "Our goal is to keep America safe, to keep South Korea and Japan from being under this threat. And when we do, we hope we can make a brighter future for the North Korean people as well." Kim committed to denuclearization at his first summit with President Donald Trump in Singapore in June. In return, Trump promised to work for a "brighter future" and "stability and security arrangements" on the Korean Peninsula, Pompeo noted. The leaders' second summit in Hanoi, Vietnam, last month ended with no agreement because Trump "understood that what was offered wasn't sufficient." The breakdown has been attributed to differences in U.S. demands for denuclearization and North Korean demands for sanctions relief. "So more work to do," Pompeo said. "What we'll need to see is action, and that's what we're counting on, and it's what I'm hopeful we'll get in the months ahead." In a separate interview, the top U.S. diplomat credited the international sanctions regime on Pyongyang for bringing Kim to the table. "One of the ways that we've convinced North Korea to move towards denuclearization is to reduce the amount of energy that they can import, and those sanctions that the United Nations put in place alongside of us have made a material difference," he told WBAP Morning News. "It's made it harder for the North Koreans to do the things they need to do." Asked in another interview about recent reports that North Korea is rebuilding a key missile facility and could be preparing for another rocket launch, Pompeo only emphasized the progress he's seen since the two sides began engaging in talks about a year ago. "They haven't conducted any further missile tests, no more nuclear testing, two important tools for advancing their program," he told KTRH, Houston's Morning News. The secretary also relayed the confidence of the Department of Defense in its ability to maintain readiness on the peninsula despite Trump's scaling back of major military exercises between South Korea and the U.S. The decision was made to facilitate negotiations with North Korea, which condemns the drills as an invasion rehearsal. "President concluded that this made sense as we're trying to develop a relationship with the North Koreans such that we can get this ultimate objective," Pompeo said.